Parrots Over Puerto Rico ia one of the winners of the prestigious award. The John Burroughs Association is pleased to announce the results of its twenty-fourth annual Riverby Award competition for excellent natural history books for young readers. The four books on the 2013 list contain rewarding observations that come to naturalists, authors and illustrators after patient hours of personal observation. The awards will be presented on Monday, April 7, at the Annual Literary Awards ceremony of the John Burroughs Association during a celebratory luncheon at the American Museum of Natural History in New York City. The Animal Book, Steve Jenkins, author, Houghton Mifflin Harcourt, (2013). The Mystery of Darwin’s Frog, Marty Crump, author, Steve Jenkins and Edel Rodriquez, illustrators, Boyds Mills Press, (2013). 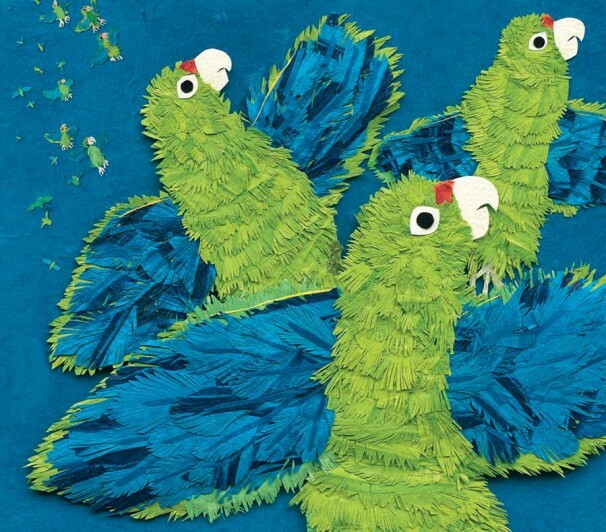 Parrots Over Puerto Rico,Susan Roth and Cindy Trumbore, authors, Susan L. Roth, collages, Lee & Low Books, Inc., (2013). The Secret Pool, Kimberly Ridley, author, and Rebekah Raye, illustrator, Tilbury House Publishers, (2013). The John Burroughs Association brings to life the legacy, writing, and natural world of John Burroughs, one of the nation’s first literary naturalists, by making his historic property “Slabsides” and surrounding land with hiking trails available to the public, and by recognizing distinguished nature writing, to encourage writing in the tradition of John Burroughs, through its annual literary awards; the John Burroughs Medal, the John Burroughs Essay Award, and the Riverby Award for nature books for young readers. We invite you to join us and celebrate the John Burroughs Riverby Award and meet the authors on April 7 at the American Museum of Natural History. Luncheon guests will receive copies of the winning books. For more information and reservations call Lisa Breslof at 212-769-5169 or visit us at http://www.johnburroughsassociation.org.